The Internet Has A Kill Switch: A Globalist Mole Has His Finger On It. (Oct. 19, 2017)—A year ago, on Oct. 01, 2016, Obama turned over control of the internet to an international body. The organization is called ICANN (Internet Assigned Numbers Authority). 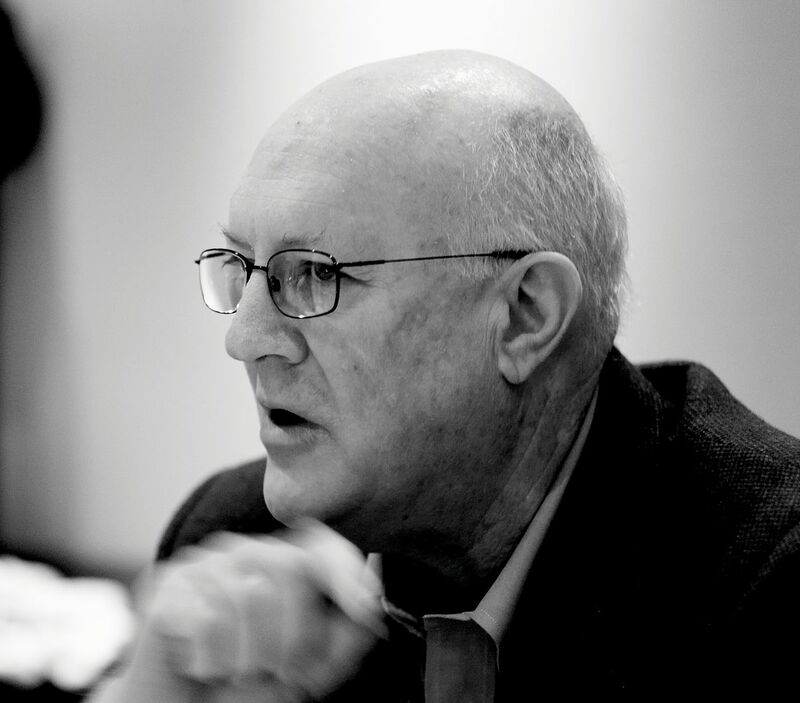 The chairman of ICANN was and still is Stephen D. Crocker. Crocker’s resume is a rat’s nest. AFI researchers are now familiar with the globalist pattern of confusion and obfuscation, and Crocker’s resume is classical misdirection. 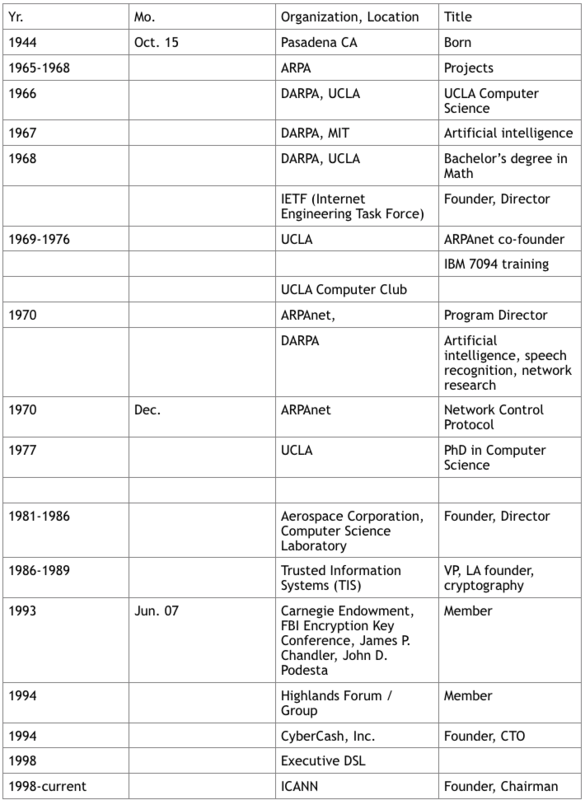 In summary, Crocker has been funded by DARPA (Defense Advanced Research Projects Agency) since 1965 when he entered UCLA in math and computer science. He eventually received his PhD in 1977 in computer science. During that time, he spent time at MIT studying cryptography. Notably, Crocker helped develop the first protocols for ARPAnet that is now called the Internet. In the 1980’s, Crocker ran Trusted Information Systems (TIS) that later became McAfee Security, and is now part of Intel. On Jun. 07, 1993, while at TIS, Crocker participated in an FBI meeting requesting an encryption backdoor key for all computer hardware, software and firmware. The meeting was sponsored by the globalist Carnegie Endowment for International Peace, Clinton chief of staff John Podesta and Clinton national security adviser James P. Chandler, III. Then, in late 1994 a year later, Crocker became a permanent member of the secret Highlands Forum sponsored by the Secretary of Defense. This forum meets to this day. These meetings are likely highly illegal since they involve private companies with no opportunity given for competitive participation. Highlands appears to be the Deep State shadow government’s military-industrial complex coordination body whose participants appear to all trade on their inside knowledge. For example, one founding participant is venture capitalist Esther Dyson who has generated billions of dollars in investments that trade on the information learned from the Highlands Forum meetings. At the same time, Crocker founded CyberCash that sold cryptography for banking, evidently trading on his DARPA inside knowledge. In 1998 under Clinton, Crocker founded ICANN (Internet Corporation for Assigned Names and Numbers). He has maintain his grip on ICANN ever since. Despite his public ICANN responsibility, Crocker traded on his inside information through his multiple private companies, including Longitude Systems (1999), Shinkuro, Inc. (2002) and CyberCash (acquired by Verisign then PayPal, 2001-2005). Crocker’s iron grip over Internet naming is evident. Few stories in technology history show such continuity. Why is this Crocker history so important to our security and privacy? ICANN manages Internet connections in the same way the phone company manages phone numbers associated with individual phones. When a website computer “server” connects a computer to the Internet, ICANN assigns a unique “DNS” number to that computer along with the associated “alias” name. For example, 199.181.132.250 is the DNS number for www.disneyland.com. The alias (“Disneyland.com”) makes it easy to remember rather than having to remember “199.181.132.250.” Whichever you type, you’ll get to Disneyland’s website. This Disneyland address is distributed through ICANN everywhere on the planet every few minutes so that wherever you are, if you type “Disneyland.com” or “199.181.132.250” you’ll go to the Disneyland website. It’s that simple. The numbers are just the physical street address on the Internet for the Disneyland website computer server. The bad news is, if a tyrant were ever to control ICANN, your website can be easily wiped off the Internet simply by NOT listing your DNS number and alias. Given Crocker’s (1) private holdings profiting from his inside knowledge, (2) his cronyism via the Highlands Group, and (3) his collusion with the Carnegie Endowment, John Podesta and James P. Chandler, III (all advisors to Bill and Hillary Clinton), no reasonable person can possibly believe that Crocker has ethical standards upon which we can rely for a stable Internet. The ICANN domain name Whois registry replicates itself many times an hour all over the Internet. All it takes to remove a website from the list is to remove it. All a tyrant must do to take a website off of the Internet is remove that website from the distribution list. We the People must demand that Crocker’s control over ICANN, and his participation in Obama’s turnover of ICANN to globalist international forces be investigated.